Thank you to Shirleta and Laura for closing out our 2014-2015 season. And thank you to all our supporters for making Carroll Cafe a success for yet another year. Come back in October for more great music! June 12, 2015 • 7:30 p.m.
Reservations are highly recommended, as many shows sell out. Shirleta Settles has the innate ability to connect with and include her audiences of all ages, whether through singing, storytelling, drama, spoken word, staff development, or on recordings. Her 15-year experience as a bandleader and lead vocalist for a 10-piece variety band, Marquise, has honed her ability to share her talent in a variety of venues and genres—R&B, jazz, blues, pop, and gospel. Joining Shirleta will be Skip Fennel on piano and Wes “Sugar” Biles on bass. Shirleta has traveled nationally and internationally, sharing her gift of music and storytelling at festivals, schools, and political arenas as well as in private engagements. She has been featured on FOX 5 News as an outstanding vocalist/entertainer. Laura Baron is known for her passionate delivery, her beautifully crafted songs, and her expressive, sultry jazz and blues vocals. She fills a venue with the emotion of her lyrics and the beauty of her voice. Joining Laura will be Dave Ylvisaker on piano and Pat Quinn on bass. Laura has received over 20 awards from the Mid-Atlantic Song Contest, including 3 GOLD awards, for Peace Someday , Kindness Don’t Rest Easy, and Winter Don’t Own Me. She is the recipient of three 2014 Wammie Awards: Contemporary Folk Vocalist and Recording & Song of the Year. Laura was a 2014 Finalist in the UK Songwriting Contest for A Little Note, a song about a woman who breaks away from an abusive relationship. All she leaves is “a little note” telling him goodbye. 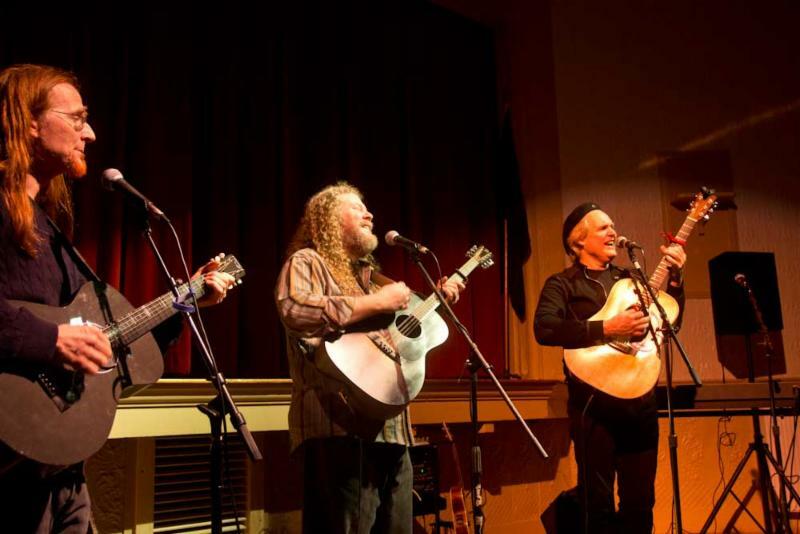 May 8, 2015 • 7:30 p.m.
National touring artists Greg Greenway, Pat Wictor, and Joe Jencks have made their mark as veteran touring singer-songwriters, but Brother Sun is no songwriter’s round. The trio’s harmonies, as much as their lyrics, tell what they are about: warm as a campfire, stirring as a gospel church, rousing as a call to arms. Fusing folk, Americana, blues, pop, jazz, rock, and a cappella singing, Brother Sun is an explosion of musical diversity and harmony, in the finest of male singing traditions. From three major points on the map–Boston, New York, and Chicago–Greg, Pat, and Joe have blended themselves into Brother Sun: a unique celebration of the amazing power of singing together. As they will tell you, the music of Brother Sun is not resident in any one of them, but rather it exists in the space between them. Audiences feel this sincerity immediately. Their combined musical skills make for an unforgettable experience, three rich voices blending on a well-crafted foundation of guitar, slide guitar, piano, ukulele, and bouzouki. Ellen Bukstel, co-author of the award-winning song “By My Silence,” provided the opening set. p.s. Look at our Upcoming page for information on the next season. Thank you, Music Pilgrim Trio! March 14, 2015 • 7:30 p.m.
Vladimir Fridman was born and raised in Moscow, Russia, with music a major part of his life. In Moscow Vladimir received his education in music and engineering. Despite the promising career as a civil engineer, Vladimir decided to pursue his real passion  guitar. Seth Kibel is the leader, clarinetist, and composer for The Alexandria Kleztet, a genre-bending klezmer band he founded in the Baltimore/Washington area. Bob Abbott has been a freelance bass player, arranger, and composer. His performance experiences range from local community festivals to performing at national political and social events. Thanks to the Dovetail Ensemble for a great show! February 13, 2015 • 7:30 p.m. The Dovetail Ensemble is a flexible company of stellar performers. Each concert is fresh and surprising, inviting audiences into the process of collaboration as well as its thrilling results. A Dovetail Ensemble performance is playful, deep, intricate, and straight to the heart. Blues harmonica master and songster Phil Wiggins joins Grammy-nominated fiddler Andrea Hoag and cellist Jodi Beder, who has been Princeton Symphony’s principal cellist and played in the rock cabaret band Zen for Primates and as a Jewish liturgical musician. For this show they’re joined by percussive dancer and Hungarian native Agi Kovacs (pronounced AH-ghee KO-vosh) and versatile guitarist Mark Puryear, for an evening that ranges from traditional Swedish music to Latin jazz, from Romanian nigun to Irish jigs, from Purcell to Mississippi John Hurt . . . and does it all with the conviction of artists who have devoted themselves to their traditions over many years, and who LOVE exploring together! The Dovetail Ensemble arose from the Old Doors/New Worlds project, which from 2009 to 2012 brought together musicians and dancers from different traditions, generations, and parts of the country to create new music. The project was unique among collaborations in its focus on process as well as product: How do we make what we make? What do we learn about our own art, and about communication, when we collaborate? What do traditional arts mean to us in a world of instant information? The Dovetail Ensemble is a piece of a larger organization called Freydas Hands, whose mission is to provide opportunities for traditional folk musicians and other performing artists to collaborate across genres, and to educate the public about traditional performing folk arts and the collaborative process. The vision of Freydas Hands is to give young people first-hand knowledge that making music and creating art by hand is an everyday part of life. Experienced artists enjoy opportunities to develop their collaborative skills and to pass on their knowledge, in depth to budding artists, and in breadth to the general public. This exceptional organization values tradition and innovation, intergenerational sharing, open participation, and striving for excellence. January 9, 2015 • 7:30 p.m. The Sligo Creek Stompers — Sarah Ford, Adrian Erlanger, Jess Eliot Myhre, and Chris Ousley — play a raucous but refined blend of traditional roots music: Appalachian and Midwestern old time and bluegrass; New Orleans-style traditional jazz; haunted Irish fiddle tunes; honky tonk and classic country; Texas and gypsy swing. Inspired by scratchy 78 rpm records, contra dancing and a good bottle of whiskey, the Stompers are keeping the flame of American stringband music alive in the Washington, D.C., area. Lulu’s Fate performs a mix of music from the Appalachian, southern string band and country blues traditions, as well as original tunes and covers ranging from Hank Williams to Tom Waits. With Tom Espinola on mandolin and guitar, Kristen Jones on cello, and singer Kara Falck, the trio blends virtuosic instrumentals with lush three-part vocal harmonies to create new interpretations of traditional tunes. Lulu’s Fate is based in the Washington, D.C., metro area and has performed at the Takoma Park Folk Festival, Washington Folk Festival, Institute of Musical Traditions and numerous house concerts throughout the area. Thank you, Ramón Tasat, Emmanuel Trifilio, Cristian Perez & trio for a wonderful show! Born in Buenos Aires, Cantor Dr. Ramón Tasat learned Ladino, the language of the Sephardic people, at his grandmother’s knee; his style reflects the rich history and drama of this extraordinary culture. Trained in five different countries, he received a doctorate in voice performance from the University of Texas at Austin. Cantor Tasat has performed at the Kennedy Center and the Israeli Embassy, toured Europe with world-renowned Dr. Robert Shaw, and participated in international festivals on both sides of the Atlantic. Emmanuel Trifilio was born in la Plata, Buenos Aires, Argentina, where he studied bandoneon, eventually joining Los Immigrantes. After winning the annual tango orchestra contest in Buenos Aires, he was invited to tour Chile with Maestro Tato Finocci. He performed for several years at the legendary Café Tortoni in Buenos Aires. In 2009 he came to the United States to perform in the Helen Hayes award-winning show, “Mummy in the Closet” at GALA Hispanic Theatre. Defying all musical labels, Argentine guitarist, composer, and teacher Cristian Perez weaves together genres from throughout the world to reveal the universality of music. With a strong foundation in classical, jazz and South American music, Cristian crafts a singular voice rich in sensitivity and nuance that freely explores the possibilities of the art form. November 14, 2014 • 7:30 p.m.
Karen Ashbrook teaches and performs Celtic, contra dance, and Jewish music and works teaching Irish music and culture to chi ldren. These days she primarily performs as a duo with her husband Paul Oorts, playing his native Belgian and French music. Karen is considered one of the finest Irish hammered dulcimer players anywhere. Add her wooden flute and penny whistle playing, and you have the consummate Irish musician. Belgian- born Paul Oorts performs on harp guitar, 10-string cittern, mandolin, and musette accordion most often with Karen. He is very active in the world of English, Contra, and Vintage dances in the DC-Baltimore area. The student ensemble The Rolling Scones opened for Karen and Paul.